Well, I did it. Took the plunge. Planted some lettuce, peas and onions today. It took about an hour to till the garden; then I turned to raking up the bigger chunks of weeds that I was too lazy to pull up last year, as well as the clumps of grass that seem to keep coming back despite the sod being pulled three springs ago. Will they ever go away? I knew when I started raking that I’d have to do another round of tilling to remove the clumps of grass I couldn’t pull up by hand. But the funny thing is, it was OK — I wasn’t worried that I’d have to work all afternoon and into the evening to get it done. Because I planned a bit (one of my goals this summer), I didn’t have to till, rake AND plant all in the same day. 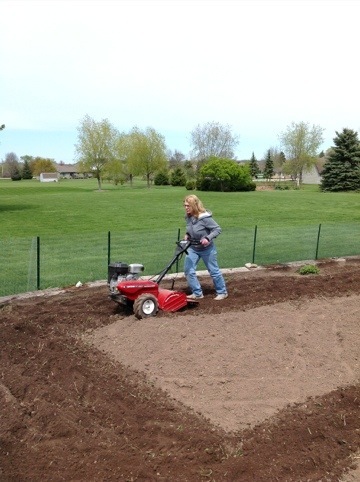 I’m so excited — we’re going to rent a sod-cutter Friday to remove the grass where my flower garden is going. And, I found out a couple days ago that one order of one order of bulbs has been shipped. The reality of my new flower garden is really starting to sink in!